We had a very blessed and productive day today. We arrived in San Miguel last night just in time for a late supper. Many on the team had been traveling since the very early hours of the morning. Our start at 6:30 a.m. was one of the latest. We arrived at the rehab center where we are working just about 7:45 this morning and got right to work unpacking the wheelchairs, parts, walkers and crutches. The people were already there and waiting for us when we arrived and we began seating by 8:30. We have some new therapists and mechanics with us and we also continued working to train the Salvadoran therapists as well. My primary job today was to oversee things and try to get everyone up to speed. Things went very well so just before lunch I had time to take a patient of my very own. As it turns out today was her 29th birthday. 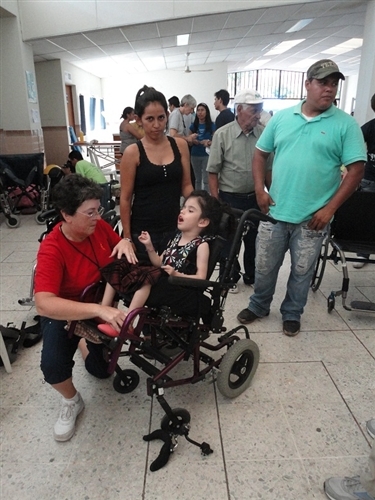 When I first saw her, she was sitting sideways in a very worn out wheelchair that gave no support. She had one arm twisted around the armrest, as she struggled to maintain a sitting position. Her Tia (aunt) who had brought her told us that when she was just 5 days old she had a fever and went into seizures and from this was brain damaged. As I got to know her a bit better, it became apparent that there was nothing damaged in her thinking and understanding, but her beautiful mind was trapped in a body that she has very little control of. I went looking for a wheelchair for her but the only one that was even a possibility for her was more than 5 inches too deep. In the world of wheelchair seating this is about 100 miles. I found a mechanic and we looked at this chair together. I really didn't want to send her away without a chair, esp. on her birthday. Jerry thought it might be possible with a lot of work to make this chair fit so we decided to try. About 3 hours later we sat our birthday girl in the chair for the first time and the result was amazing. She was able to sit up straight and relaxed for the first time in her life. The smile on her face in that chair made all the hard work more than worth it. Can you imagine what it must have felt like to be able to sit up comfortably for the first time at the age of 29? We made a few final adjustments and she and her family went to meet with the pastor and receive a brand new Bible too.